Tourists slip into a Bourbon trance as they swivel and nose a small batch label in the tasting room at Heaven Hill’s Bourbon Heritage Center. Meanwhile downtown, two ladies sip cocktails at the Bourbon bar inside the shiny new Kentucky Bourbon Marketplace. A block away on Court Square, Col. Michael Masters garnishes his legendary mint juleps for guests at the Kentucky Bourbon House. In Bardstown, the spirit of Bourbon appears inside distilleries, in small businesses and in the welcoming smiles of locals who are bound by the distilling tradition. Proudly touted as the “Bourbon Capital of the World,” Bardstown welcomes thousands of visitors every year who are on a mission to conquer the Kentucky Bourbon Trail. 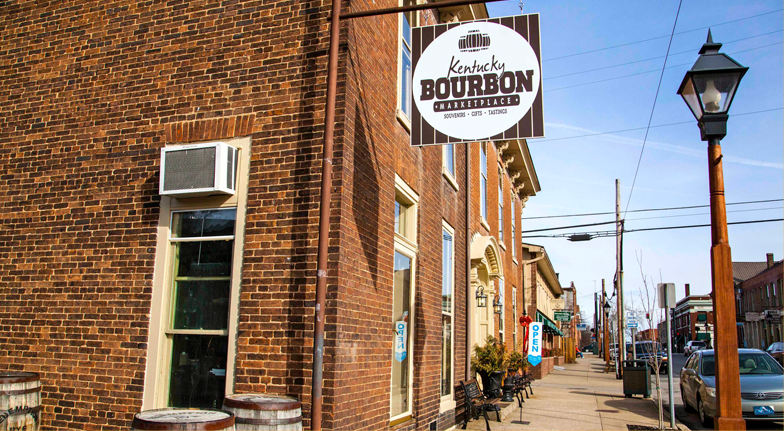 Bardstown is centrally located near four world-famous distilleries, as well as many markets, bed and breakfasts, restaurants, and historical sites that embrace the local Bourbon culture. In addition to sitting pretty with the world’s finest Bourbons, Bardstown is known for its history, ambiance and charm. Visitors can still order from a drug store soda fountain and board an old-fashion dinner train in Kentucky’s second oldest city. The road into town dips alongside the famous rolling hills of My Old Kentucky Home State Park, the estate made famous by 19th-century American composer Stephen Foster. This pleasant portrait of small-town America has earned Bardstown national recognition, including the title of “Most Beautiful Small Town in America” from USA Today in 2012. Proud hosts of Bourbon Country’s sweetheart town, the locals embrace the “angel’s share” that’s said to be evaporated in the air. You will fall in love with this timeless town that’s overflowing with a love of Bourbon – on a day trip, weekend visit or returning vacation. Here’s a checkoff list for the many distilleries, as well as places to stay and eat (and drink) while in Bardstown. The post Bardstown, KY appeared first on The Bourbon Review.